The Earhart bucked, and the contingent of Klingons packed into the shuttle all glanced about at each other. Everything about the shuttle was just too Federation, from the inoffensive off-white walls to the subdued nondescript lighting to the slightly sterilized smell. Commander Krom shifted uneasily in his seat next to Captain B’ram. The Federation environmental suits fitted well enough—if they still had the heavy build and physiology that predated the Augment virus, the suits likely would have been too small; as is, the Klingon troops were barely distinguishable from Humans. A sad state of affairs, but one that would hopefully be remedied as soon as Imperial troops arrived. “Yes, sir,” the pilot replied in a clipped, military tone. He clearly struggled with the controls, unfamiliar with the Federation design. Everything built by the Federation looked like it was made from twigs and glass, but was surprisingly resilient. Even from the bench seat, Krom could see that the pilot was sweating profusely. It must’ve taken a tremendous amount of control to keep from losing his temper and simply snapping off the controls, but a gentle touch was too little to evade the debris from the asteroid field that surrounded them. It was almost painful to watch, and not in a good way. “The charges are ready. They will work or they won’t. You have no tools to repair them if something is amiss. There is nothing more to do but wait for your duty,” said Krom. Varss folded her hands in her lap over the crude explosives. “Yes, sir,” she said, staring intently at him. Krom glanced at the other troops—all soldiers who’d been on Federation Starbase K-13, on leave under treaty stipulations. Soldiers of the Empire who’d been catapulted across space and time along with their Starfleet “hosts” when the station was pulled into a disruptive temporal anomaly. All hardened Klingon warriors, ready to honorably give their lives in the performance of duty. All recently awakened after centuries of stasis-induced slumber on the decrepit remains of the station after its rediscovery by an unscrupulous Ferengi. And now? Now they found themselves thrown into a crisis, tasked with trying to save K-13 from destruction as a massive asteroid closed in on its position. If a ship from the fleet had been there when the confluence of orbits had been discovered, it would’ve been easy to handle… and the Starfleet officers claimed that a ship was on its way and would be there… just half an hour too late. A strange coincidence - waking up after centuries of dreamless rest, only to have one’s life shaped by a change of orbits that would make a matter of minutes a fatal confluence. “Of course, Captain,” said Krom. He knew better than to disagree, or even to make a conditional statement. Captain B’ram was a cutthroat leader, tactically skilled but also very much used to getting his way. If his first officer made any sign of disagreeing with him in front of his troops, he’d get a new first officer…shortly after dispatching their rebellious predecessor. “Yes, sir,” said Krom again. Honor and glory, he thought bitterly. Words that fools and braggarts cling to in the face of death. Neither honor, nor glory, led anyone of us to move the station out of the asteroid’s path. Our pilot can barely fly one of their shuttles. We could never fly the whole station, but we could be glorious and honorable while we tried. Truly, the wind – or an asteroid – does not respect a fool. “Unfortunately, we must save the station if we are to survive,” ventured Krom cautiously. Krom felt a momentary thrill at the idea. He wants to take the station, Krom thought. He wants to kill the Federation officers! But how can we keep it? Their relief ships are already on the way… we could never hold against them in that barely-functional base. It doesn’t even have weapons! The Ferengi thief saw to that. “It would certainly be a great disaster for the Starfleet crew,” Krom finally ventured cautiously. Krom considered the problem. Captain B’ram was right—if they kept one of the charges in reserve, they could destroy the doors to the shuttlebay. The whole area would depressurize. Many of the Starfleet officers would doubtless be in there when the Klingons returned. With the environment suits, the Klingon troops would survive, but the humans and their allies wouldn’t. Even a Vulcan couldn’t survive a vacuum. But he continued to imagine the results—the Klingon soldiers sweeping through the rest of the station, rounding up or killing the remaining few members of Starfleet. That would be easy. Then the relief ship’s arrival. What then? Even if the station had weapons, it would be no match for one of those future-ships. Ship of the present, really. They’d all die for no reason, apart from glory and honor. The troops nodded and the rest of the trip was silent as the Earhart intercepted and landed on the surface of the large asteroid that now threatened Deep Space K-13, after seven hundred years of orbits that had never met, thanks to the meddling of one Ferengi. At the captain’s order, the Klingons secured their helmets, and then stepped out of the lowered back door of the shuttle. The asteroid’s microgravity meant that they had to rely on cautious movements and secured tethers to step across the iron-and-silicon surface. The Klingons split into three groups and started their journey across the desolate surface of the asteroid. To Krom, it was nerve-wracking. His steps were slow and measured, so that he wouldn’t float away. They had so little time to finish the job, yet they had to proceed by fractions of a kellicam. And what awaited them? Captain B’ram’s plan for them all to wind up dead aboard a decrepit station as little more than space pirates. Krom could feel his frustration bubbling up, but it simply caused him to become nauseated with anxiety. There was no enemy to fight, no way that his rage could be directed into a burning pinnacle of victory. Just the slow, constant crunch of the asteroid’s surface beneath boots that were not quite right, enclosed in a suit that didn’t smell quite right, looking out at stars that were not quite right. Krom shook himself out of his inner turmoil and looked back at Varss and the others. They showed no signs of nervousness, none of the dread that he felt. They simply awaited orders. The rocks around Krom showed little differentiation. It was mostly gray, mottled with tiny rusted specks. Krom suddenly felt like it didn’t matter—it was all the same. The Starfleet scientists had said that the charges needed to be placed in specific locations, but looking at the surface of the asteroid, it felt like it made no difference. Krom straightened his shoulders and decided that he would make the difference. Krom cut him off. “Would I do something without the captain’s orders? No. Make it happen.” Then he clicked the channel back over. “Varss.” His voice growled slightly. “Sir?” she said. She’d just finished setting the charge detonators and handing them to the other members of the team for placement. Varss paused, and for a moment Krom wasn’t sure which way she would go. As a lieutenant she had little real authority, but she was smart—smart with technical devices and smart with people. She could go far if she weren’t hamstrung by circumstance. And she almost certainly knew what Krom was thinking. Varss paused, then said, “Yes, sir. I understand you.” She turned and barked to the others. “Give me the charges. I’m setting them myself.” She retrieved the explosives and placed them with epoxy adherents securing them to the surface of the asteroid. Like good soldiers, the Klingon troops shuffled back in the direction of the Earhart. Milling about at the back door of the shuttle, the two squads of Klingons waited for the word from their captain. “What’s taking him so long?” asked Tomar. He looked annoyed—what little Krom could see of his face through his helmet, anyway. “The captain is no doubt making sure that there are no unexpected problems,” said Krom. “Are we not Klingons?” rang out the captain’s angry reply. “Do you think we should fear them? We will fight them hand-to-hand if we must! First the Federation, then these Ferengi, then whoever comes to challenge us! This will be my kingdom! My domain! Any who stand against me… will die!” he shouted. Krom looked to the other Klingons with him. The captain continued to rant, his tone becoming increasingly strident as his reassurances at the violent and final treatment of traitors came through. The troops were unsteady now; if the captain had his way, there would be no way out. Anyone who defied the captain would be killed. Anyone who supported him would be killed as well… in a futile struggle against enemies they’d never met, in a century not their own, in a galaxy they no longer understood. Krom turned to face Lieutenant Varss, brought up his gloved hand, closed it into a fist, and chopped downward. Varss raised the remote detonator and pressed the button. The asteroid rocked, and the Klingons rushed into the shuttle to make their escape. 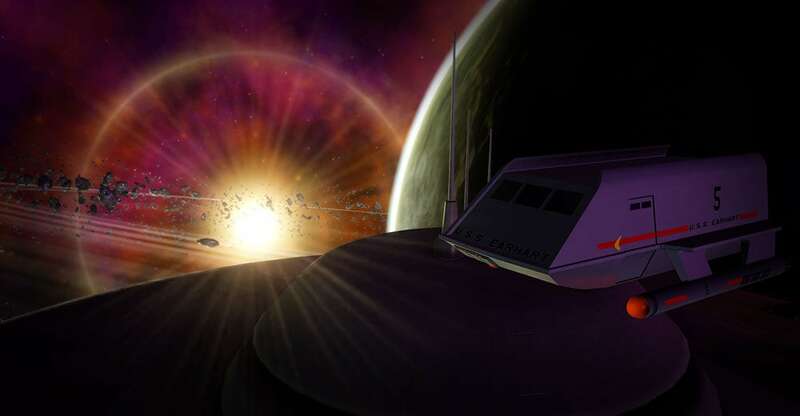 The pilot struggled with the controls once more, but managed to steer the shuttlecraft away from the asteroid. In the distance, K-13 sat suspended in the dark void of space. All was well. “Federation treachery!” someone – Tomar? – yelled from the back of the shuttle. Curses and growls of agreement filled the air. Treachery. Krom couldn’t help but smile. Perhaps the Federation is more Klingon than you know, Captain. In the shuttlebay of K-13, Krom doffed the helmet from his suit. The Earhart, scarred and battered by debris, lay half-buried under flame-retardant foam. The coil leak in the main engine wasn’t particularly bad while in space, but once inside the atmosphere of the shuttlebay it had become incendiary. The Starfleet engineers had rushed to extinguish the fires with little thought to their own safety, and their medics had not hesitated to pull the Klingons out and check them for injuries.